Zircon Sand is a naturally occurring mineral and its composition depends on the geological history of the parent deposit. In its raw state, zircon sand is found associated with other minerals, e.g. Rutile and ilmenite. Zircon is separated from these minerals using special ore dressing techniques. it is processed and milled to a variety of particle sizes by a number of different production techniques. 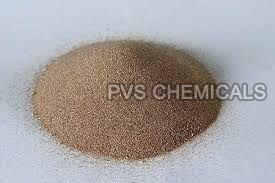 The main applications for zircon sand are in ceramics, refractories, TV glass and the production of zirconium oxides and zirconium chemicals. Iron and Steel : Used with chemical binders for high quality steel castings and for critical iron castings. It is also used in core and mould washes to improve surface finish. Ceramics : Used as opacifier in glazes and frits to enhance resistance of the finished product against water, chemicals and abrasion and as a whitener in porcelain tiles. Refractories : Used for its high thermal stability and non-wetability against molten metals. Products include bricks used to line steel making furnaces and casting channels for refined steel continuous castings. High specific gravity and high thermal conductivity = castings cool faster than silica sand.